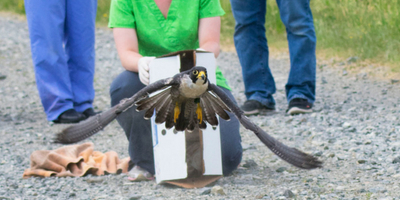 An interesting case in the clinic this spring included this Peregrine Falcon being released by Lisa Rosenkrans, V19, on June 12. The peregrine falcon was admitted on May 2 with right radial and extensor process fractures. Upon radiograph, the right extensor process fracture was not displaced and right proximal radius fracture was well-aligned, giving the bird a good prognosis. The staff wrapped the wing, and with time, medication, and limited movement, the fracture healed well, and we were able to release the bird here at Tufts. This peregrine is one of 10 peregrine falcons already admitted to Tufts Wildlife Clinic this spring.